The pool is currently closed for the season, but apply for a season pass NOW! Thinking about enrolling in swim lessons or swim team for the 2019 season? Visit our Everybody In page for program information, and check back frequently for updates. The newly renovated Ziegler Park pool was designed with YOU in mind. 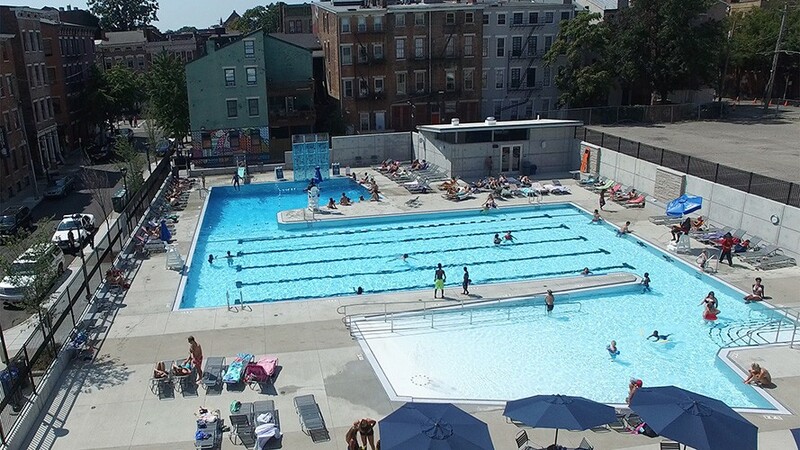 This neighborhood swimming pool is focused on serving the local community – children and adults alike. Join us at the pool for fun and excitement the whole family will enjoy! According to medical research, water is the ideal medium for body rehabilitation and exercise and plays an important role in helping a child gauge his or her body boundaries. Water can improve posture, balance and coordination while soothing, calming and providing the necessary sensory input we all crave. We've done our research, and we've designed a pool that caters to all types of swimming capabilities, levels and activities including all forms of recreational and competitive swimming events. Along the western side of the shallow pool is an accessible ramp with handrails that leads swimmers into the pool – ramp slope and length were carefully considered to provide full and easy accessibility, eliminating the need for a mechanical deck-mounted lift. In addition, a fully accessible Pool Service building provides restrooms, showers, first aid and concessions. While the pool can be utilized for general open swimming, swim lessons are also offered. The Ziegler Park pool is managed by SwimSafe – a pool management company that strives to provide the highest standards of safety, cleanliness and customer service in the industry. SwimSafe not only oversees the day-to-day operations of the pool, but provides a full staff, unsurpassed pool services, and maintenance & repairs as well. SwimSafe is committed to continuously training its staff using the most up-to-date training and certification programs to ensure they are prepared through constant education and supervision. Staff members include Lifeguards, StarGuard Instructors, Water Safety Instructors, a Water Safety Instructor Trainer, a Lifeguard Instructor Trainer, an Aquatic Examiner, food concession workers, supervisors and administrative staff. For more information on SwimSafe Pool Management, please visit http://swimsafepool.com/.